Music is as annoying as it is wonderful. I mean, the listening part is great. But taking the time to curate playlists on Spotify or conjure up the right artist to feed Pandora in exchange for a fresh playlist is tedious, at the very least. But Songza brings the expertly curated playlist straight to your smartphone with little to no work on your part, and today that magic extends to iPad land. That’s right. Songza has just launched an iPad app, and let me tell you, it’s beautiful. For those of you that don’t know, Songza takes all the heavy lifting out of enjoying and discovering music. In essence, you can choose from a rather long list of activities, and have curated playlists served up to you based on what you’re doing. But Songza took that a step further with the introduction of the Concierge feature a couple months back. Concierge takes what it knows about your music preferences, notes whether or not you’re on a PC or a mobile device, and factors in the day and the time. From there, it gives you a list of five or six activities that you are probably in the midst of, and from there you can filter based on genre or mood, and choose a playlist. For example (and oh how I love this example), if it’s late Friday night, you’ll be offered activities like Getting High, Getting Lucky, Nightcap, A Sweaty Dance Party, or Bedtime. So if you choose Getting Lucky, you’ll then be given filters like Aggressive, Smooth, Mellow, Heartfelt, and Tongue And Cheek. It’s a pretty incredible app for anyone (like myself) who isn’t all that great at compiling playlists and/or finding awesome new music. As you can imagine, it’s even better on an iPad. The extra real estate has allowed Songza to minimize clicks, taking you from four clicks to three inside Concierge. The extra information on a playlist, including its maker and the artists featured within it, has been added to the list of suggested playlists. It’s all about convenience with these guys. The Popular tab still offers the most popular playlists of all time alongside trending playlists, but a slick new Featured carousel has been added up top. Now that Songza is working directly with artists, like Ke$ha, to build playlists, a Featured carousel only makes sense to display those more prominently to users. The app also gets a bit more social in iPad form. What used to just be a list of Recent and Favorite playlists under the My Playlists tab is now a social hub as well. So you’ll see all of your playlists in two separate windows up top, with a feed along the bottom showing what your friends are listening to. The Explore tab basically has all the same functionality, but you can navigate much more easily with all that extra real estate. In the past (and on iPhone), Songza has always displayed cover art while music is playing, along with a small banner ad. 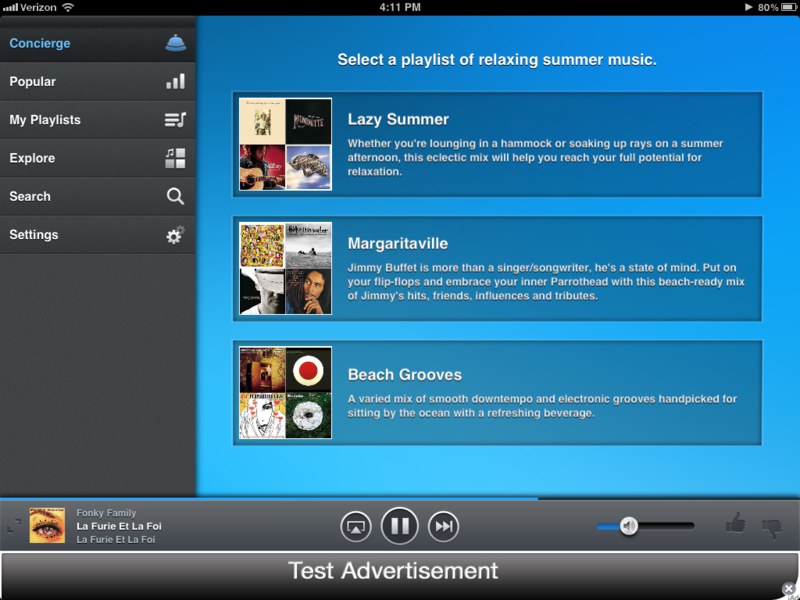 With this iPad version, the app comes complete with a visualizer, which Songza has dubbed “College Mode”. So, the cover art is still in the middle, but flashing, colored light goes to the beat of the song, and the color can be controlled by swiping your finger across the display. 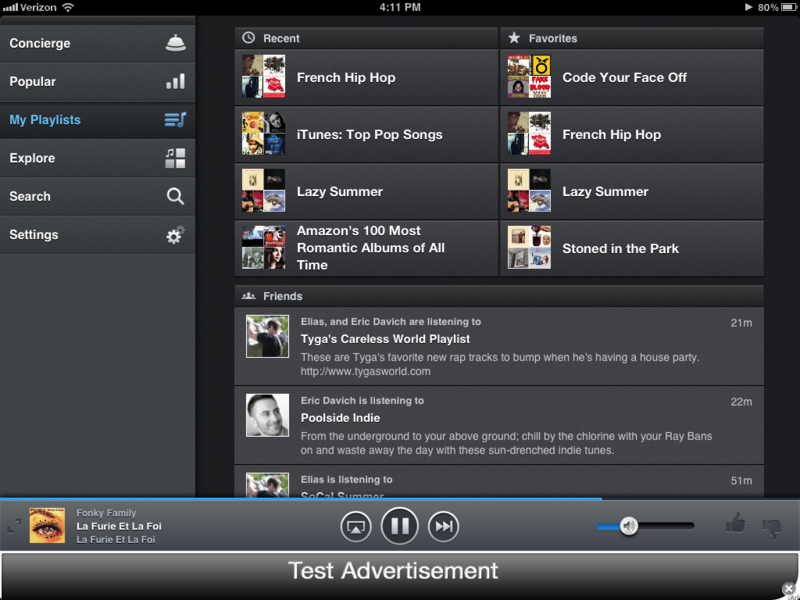 Just like everything else from Songza, the iPad app is free and available now in the App Store.